Hear ye, hear ye, twenty (20) tons more sand is on its way. Who will spread it? You? Great. Now that generosity and labor are pouring in, we are interested in your ideas for edging the court. My idea was sod, but Chip (of Charlie's best buddy fame) thinks it'll die like Nixon. Sandbags? Rubber mulch? Cedar mulch? Someone out there knows the solution, bring it forward. People are in motion, and we have to keep it that way. Mark your calendars for this Saturday, June 20th. Not only are we at 737 (that's really the address of the HypnoCoffee, Highland Prospects complex) throwing a shindig to welcome the new tenants, but that evening around five (5) Ben and Jeremy are having an off-complex party at Mountain State Brewing. Food and beer will be provided, so bring both appetites. This morning's post failed to thank Michelle at the Purple Fiddle for her efforts at the aforementioned bike race. We roast coffee for the Fiddle and sent Michelle with our wares to peddle at the 24 hour race. Not only did Mackie clean up on the podium, but Michelle cleaned up at the vendor section. Helping her kill it was a special blend we roasted just for her and the race. Half way into the first day she ran dry and we sent reinforcements her way. Thanks for giving us pub at the event, and it's cool to have local partnerships that bolster each other's bottom lines. 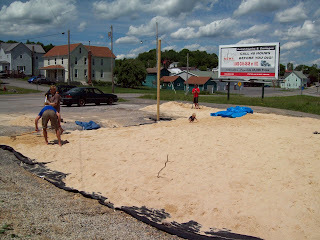 Howz 'bout coffee grounds fo da v-ball court borda?! old mattresses? bit that would get quite dank, eh?